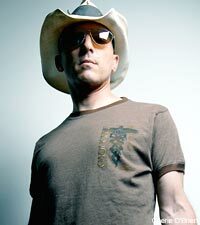 And in taking a closer look at the Maynard James Keenan-led project's album credits, it seems as though 'Potions' -- track number five -- is co-written by Nine Inch Nails mastermind Trent Reznor, invoking memories of Maynard and Trent's oft-mentioned, never fully realized side-project Tapeworm, which ceased to exist in 2004. If speculation serves correct, the Tapeworm track that appears on this EP is the second Tapeworm song committed to recording and released by Maynard. Prior to 'Potions,' the first and only Tapeworm material to be released in any form was through Keenan's band A Perfect Circle, who reworked the Tapeworm song 'Vacant' and released it as 'Passive' on their 2004 covers album 'eMOTIVe.' The band was known to play the track live to Reznor's discontent, but the song appeared on the collection nonetheless. Aside from Reznor's co-writing credit on 'Potions,' the self-released EP 'C is For (Please Insert Sophomoric Genitalia Reference Here)' features many guest appearances and collaborations from notable musicians and actors alike, including Tim Alexander, Milla Jovovich and longtime all-things-Maynard collaborator Danny Lohner, among others.